I’m a qualified dog behaviour consultant who resolves the emotions that cause behaviour problems. I choose gentle, ethical and science-based methods and keep my techniques current by attending annual conferences and workshops on dog training and behaviour consulting. I work closely with vets, veterinary behaviourists and animal shelters to ensure comprehensive care for the dogs and owners I support. Accredited Dog Behavioural Trainer. I stay up to date through annual conferences and workshops, and work closely with vets, veterinary behaviourists and animal shelters. Certificate IV in Companion Animal Services (Delta Society). A government accredited 2.5 year behavioural training course known for scientifically proven, positive reinforcement-based dog training techniques. Graduates are qualified as dog trainers and behaviour consultants. Pet Professional Guild Australia Member (PPGA). Professional members must be qualified, audited for continuing education, adhere to a code of ethics and use empirically-based and humane methods. Association of Pet Dog Trainers Australia Member (APDT), which advocates dog-friendly training and works to improve training through education. Its conferences feature top international scientists, behaviourists and trainers. PhD in Genetics from the University of Melbourne. I’m interested in the science behind animal behaviour and training. 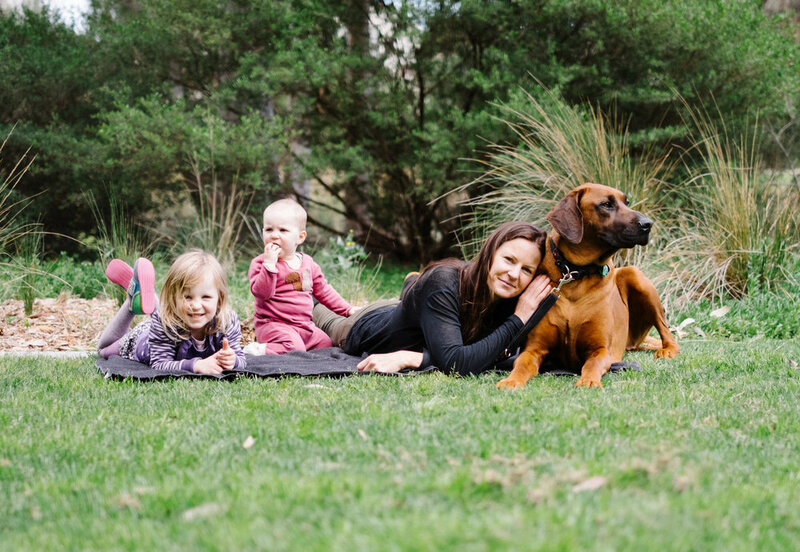 I have extensive experience teaching groups and individuals of different ages and cultural backgrounds, not only as a dog trainer but as an academic and a wildlife demonstrator for children. I hold a current First Aid Certificate and Working with Children Check, for your family’s safety and peace of mind. I am kept on my toes by my two young daughters, our bouncy 60kg Rhodesian Ridgeback, Django, and our old girl Lola the Burmese cat. Our life is busy and fun, and my girls are wonderful with their pets. One of my first memories is helping Grandma to wean Staffordshire bull terrier puppies. She taught me how to use positive reinforcement to teach puppies how to walk on a lead. I now feel lucky to work not only with dogs but a range of native animals, training for educational wildlife presentations. I like to use similar training methods with dogs because the result is a calm, trusting and motivated animal. My work brings together my interests in animal behaviour, science, education and making life happier for people and animals. I am dedicated to taking the pressure off new parents and their dogs. I know the challenges and I have plenty of tricks to share with you. We’ll come to you and help sort out your dogs behavioural issues.